Irish actor, comedian and musician Pat Shortt plays the garrulous gossip Johnny Pateenmike who peddles rumours and applies himself to finishing off his 90 year old mother – played by the wonderful June Watson – with alcohol in Michael Grandage’s dark, politically incorrect 1997 comedy The Cripple of Inishmaan at the Noel Coward Theatre. Better known as the crazy Tom in Father Ted, who was always wearing a tshirt with the slogan “I shot JR”, he also appears on a postage stamp as Josie, from the award-winning film Garage. 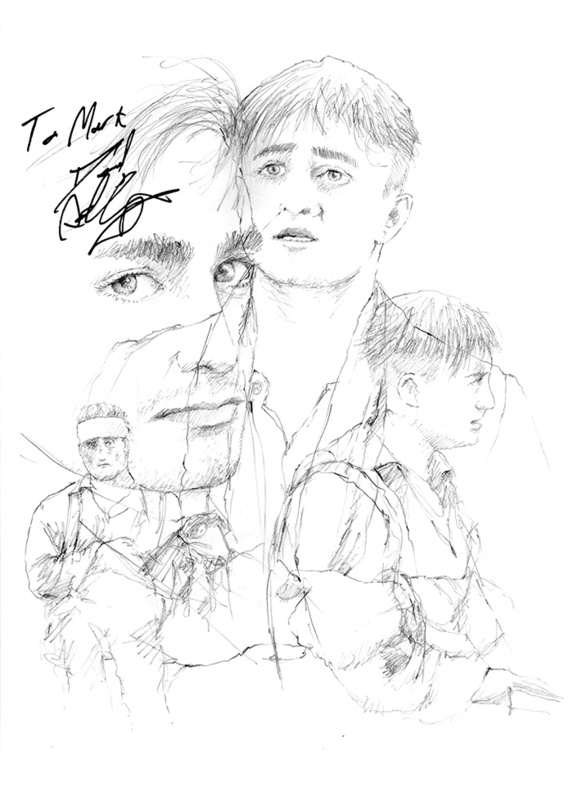 Both Pat & June signed my sketch in July 2013 and will join the rest of the cast in the Broadway transfer this April. Irish actors Sarah Greene and Conor MacNeill played the feisty siblings in The Cripple of Inishmaan – the third of five plays in the Michael Grandage season at London’s Noël Coward Theatre during the Summer of 2013. Sarah played ‘Slippy’ Helen, the egg throwing, foul-mouthed object of Cripple Billy’s desires. “I shouldn’t laugh at you Billy… but I will.” Conor plays her mischievous younger brother, Bartley with a passion for sweeties and telescopes. The play was magical – there was, after all, a wizard in the title role – and it cast a mis-spell over me. Both will be a part of the returning cast when Inishmaan takes on the Broadway boards in April. Daniel Radcliffe picked up Best Actor from the fan voted What’sOnStage Awards over the weekend for his role as Cripple Billy Claven in Martyn McDonagh’s dark comedy The Cripple of Inishmaan, in Michael Grandage’s sold out run last Summer at the Noël Coward Theatre. Described by The Mail on Sunday as, “the most politically incorrect play in the West End… and probably the funniest”. On discussing perfecting his Irish accent, Daniel said his father’s from Northern Ireland and he was “pretty pleased”. He will reprise the role along with all the other cast members at the Cort Theatre on Broadway this Spring for a strictly limited engagement. Daniel was excellent, both on and off stage. Every night after his performance he met the hordes of fans at the stage door. When he signed this sketch he apologised, “I’m sorry my signature’s not very good tonight.” Given he writes his full name out with the tangled ‘liffe’ at the end, I think he does exceptionally well, and as a collector it’s good to get all variation. Gillian Hanna and Ingrid Craigie played the sisters and aunties to ‘Cripple Billy’ in Michael Grandage’s The Cripple of Inishman at the Noel Coward Theatre from June til August last year. It was part of the Michael Grandage season of 5 plays and featured Daniel Radcliffe in the title role. Gillian and Ingrid have picked up a number of award nominations for their brilliant performances, including last weekend’s WhatsOnStage Awards in London. The play will transfer to Broadway in April. Sir Bob Charles is a New Zealand sporting hero. His golfing achievements over five decades rank him as one of the most successful left handed players of all time. He was the first ‘lefty’ to win a major, securing the British Open Championship title in 1963 after a 36 hole playoff with American Phil Rodgers. He is also the first player with a left handed swing elected into Golf’s Hall of Fame, although ironically Sir Bob is actually right handed, except “games requiring two hands”. He came close to winning more major titles with runner-up finishes in The open in 1968 and ’69, the PGA Championship in 1968 and third place in the US Open in 1964 and 1970. While the whole film industry congregated next door for the BAFTAs at the Royal Opera House last Sunday afternoon, the dreaded and drying metallic silver marker pen made an unwelcome appearance at the Theatre Royal in Drury Lane. A handful of expectant ‘graphers gathered by one of a dozen possible doors in anticipation of catching ‘Danny Zuko’s’ early arrival for ‘A Conversation with John Travolta’. A large black Land Rover pulled up, signalling the designated entry point, and like Greased Lightening we quickly slipped into position. Chills weren’t the only thing multiplying as numbers suddenly swelled and it was the quills multiplying…. well, not exactly, but a quill would have been a lot better than the dreaded drying metallic silver marker that belonged to the first person who greeted John with a ‘graph request. He was more than happy to sign as many as possible, but with the wretched rendering instrument, not the one that I want! Ew, ew, ew! Always remember when ‘graphing, be first in line, or make sure that if you can’t be first, give em a black sharpie! Six foot four Croatian high jumper Blanka Vlasic is one of high jump’s most charismatic characters. Named after the city of Casablanca, where her father, Josko (also her coach), won the decathlon gold in the 1983 Mediterranean Games around the time of her birth, Blanka is second in the all time high jump rankings behind the Bulgarian great Stefka Kostadinova. Unfortunately, illness and injuries have plagued her career, but in spite of this she has fashioned an impressive record since competing in her first Olympic Games in Sydney (2000) at the age of 16. She has won gold twice at both the World and the World Indoor Championships and narrowly missed the Olympic title in Beijin, winning the silver. In 2010 she was named IAAF World Athlete of the Year. She missed the London Olympics in 2012 due to complications after an achilles tendon operation, but is now back competing, beginning with the Gothenburg Meet last Saturday. Blanka signed my sketch at her home club in Split in September 2012. Lucy Bailey’s new staging of Ivan Turgenev’s savagely funny FORTUNE’S FOOL completes its successful season at the Old Vic this week. It featured Iain Glen and Richard McCabe in the lead roles, until the former had to recently leave the production following doctor’s advice. Critics praised the play, with The Observer calling it a “little masterpiece”. It described Iain’s performance as “perfect” and Richard was “magnificent”. 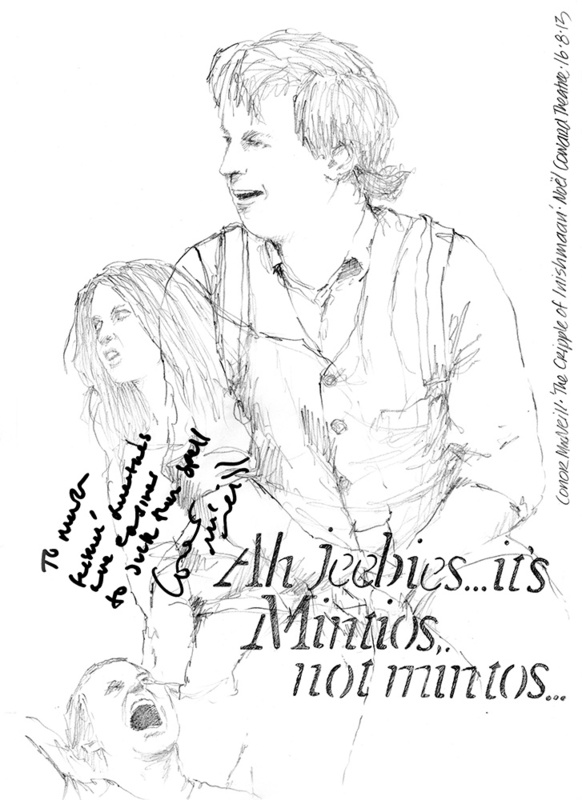 Unfortunately, I waited at the stage door with this drawing on the day Iain left the show. Richard, as usual was happy to sign, but I missed Iain and finding out about his illness and subsequent withdrawal presented a different kind of challenge. Rats! Fortunately, I decided to leave it at the Theatre with a note and return envelope in the hope that someone may pass it on to Iain along with a bundle of ‘get well’ cards. And indeed hope sprang eternal… well it sprung a siggy and dedication from the man himself, which arrived by post yesterday.